Oak wilt (OW) is caused by an introduced fungus with the scientific name Ceratocystis fagacearum. This fungus probably originated in Central or South America, though no one really knows for sure. It is a major threat to oak forests throughout the ceded territories. The oak wilt fungus grows into the tiny water-conducting structures (trachieds and vessels) of the oaks, clogging them and starving the tree of water and minerals. 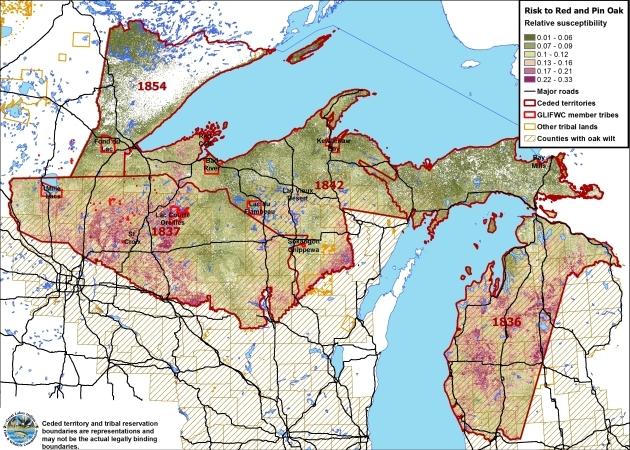 Oaks in the red and black oak group (including northern red oak and pin oak, both common in the ceded territories) are highly susceptible to OW, and are often killed within 1-3 years of being infected. White oaks (including bur oak) are much more resistant and may persist for a decade or more after being infected. When they grow in close proximity to each other, red and black oaks often form root grafts with each other. The oak wilt fungus spreads rapidly through the root grafts between red and black oaks, while it spreads much more slowly through the roots of white oaks. It also spreads by spores carried by several species of bark beetles. After red oaks die, the fungus often forms fungal pads under the bark the following spring. These pads range from several inches to several feet across. They thicken until they split open the bark, exposing numerous spores and producing a fruity odour that attracts bark beetles. The beetles feed on the fungus, and can carry spores to other oak trees whose bark has been broken or wounded. That's why it's very important to avoid pruning or damaging oak trees between April 1 and August 1 (or better yet any time during the summer), when the spores are most likely to be carried by the beetles. Oak wilt is potentially very controllable. Unfortunately careless individuals continue to bring infested wood from areas with oak wilt, and infesting new areas. 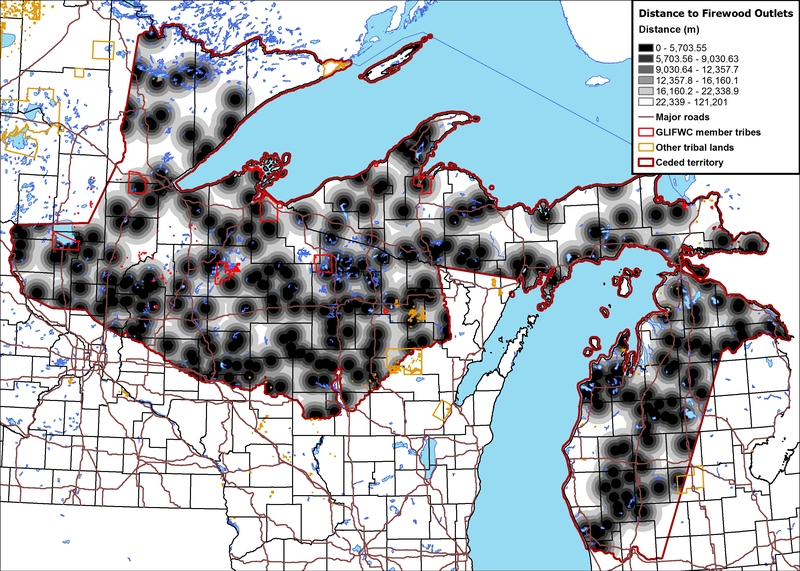 Humans are almost entirely responsible for long-distance transport of oak wilt, by damaging healthy trees and moving infested firewood. 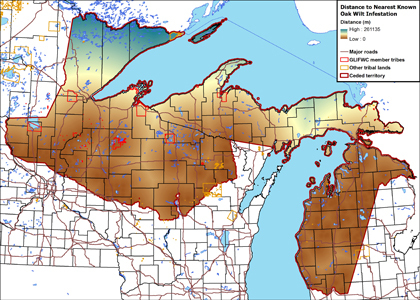 Except in parts of Lower Michigan, oak wilt is still rare and local in the ceded territories. 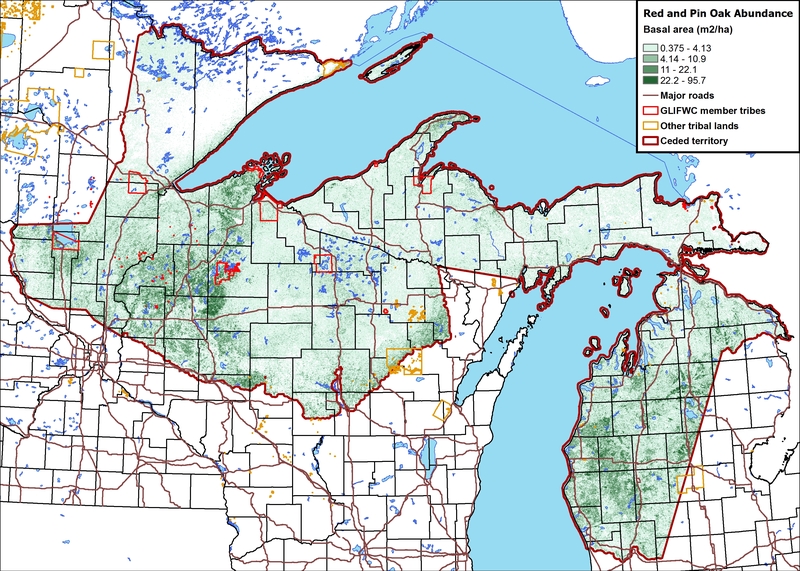 Areas with sandy soils (Including the LCO, St. Croix, Red Cliff and Mille Lacs bands) are likely to be more heavily impacted by oak wilt than areas which have heavier soils and less oak. Northern red oak and pin oak are both common across most of the ceded territory. Bur oak and white oak are often common in sandy areas. 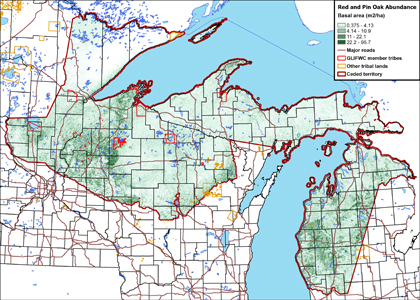 By putting "total red and pin oak" and "total bur and white oak" first and second in the model, and "distance to nearest oak wilt infestation" and "distance to nearest firewood outlet" third and fourth, vulnerability to infestation is emphasized, giving the following model. 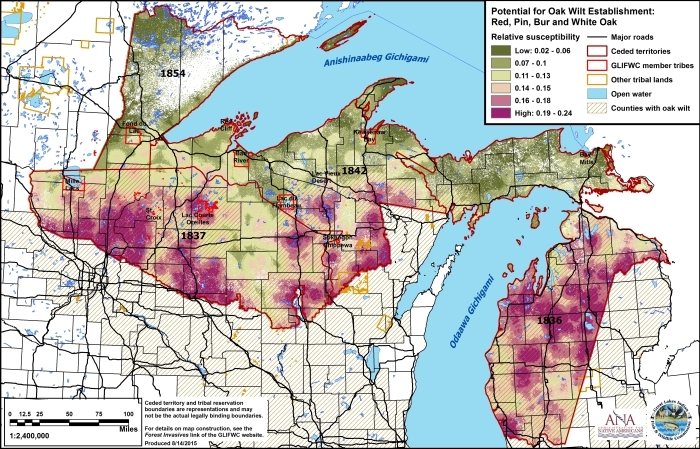 This model shows relative risk to oak wilt, if and when it becomes widely established across the region. This very nice 38-page booklet (O'Brien et al. 2011) has all the basics on how to recognize and deal with oak wilt, and how to avoid spreading it. 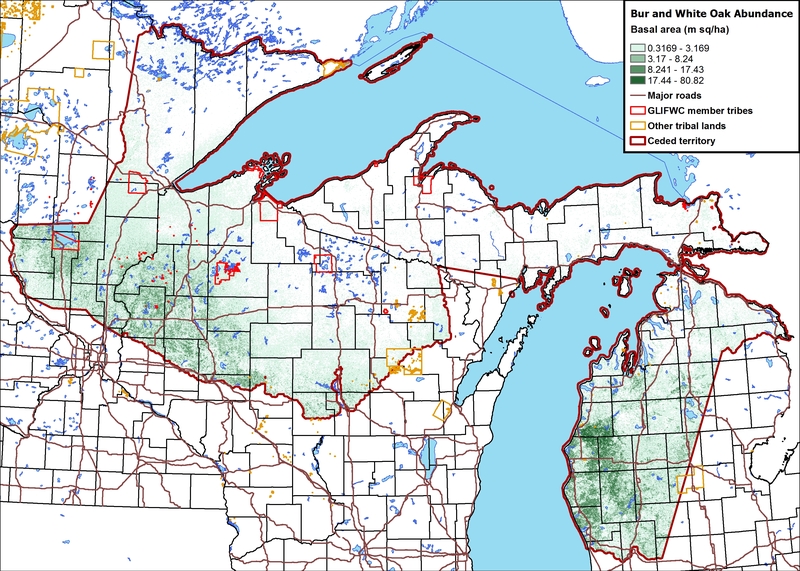 Lake states woodlands: Oak wilt management-what are the options? This 6-page UW-Extension Publication (#G3590) (Carlson et al. 2010) also gives a very good overview of oak wilt symptom, prevention and management. Excellent photos. 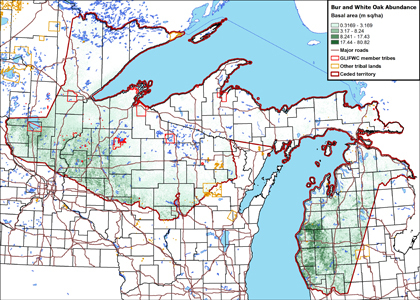 Basic information about oak wilt in Wisconsin.